Ralph O. Sacco, age 94, passed away April 2, 2019 joining his wife of 72 years, Lindy. He was born February 9th, 1925 to Emil and Rose Sacco in Spokane. He went to school at Garfield Elementary and North Central High School. 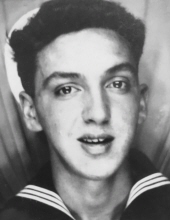 He then joined the U.S. Navy where he proudly and honorably served in nine major naval campaigns including Leyte Gulf. After returning from the war, he received his A.A.S degree in printing and then taught at Spokane Community College. He then purchased Service Typesetting which he operated for decades. Ralph was a long time member of the Fraternal Order of the Eagles. He enjoyed golfing but his true passion was being with family. Ralph is survived by his son, his daughter and two grandchildren. He will be loved and missed forever. To send flowers or a remembrance gift to the family of Ralph O. Sacco, please visit our Tribute Store. "Email Address" would like to share the life celebration of Ralph O. Sacco. Click on the "link" to go to share a favorite memory or leave a condolence message for the family.